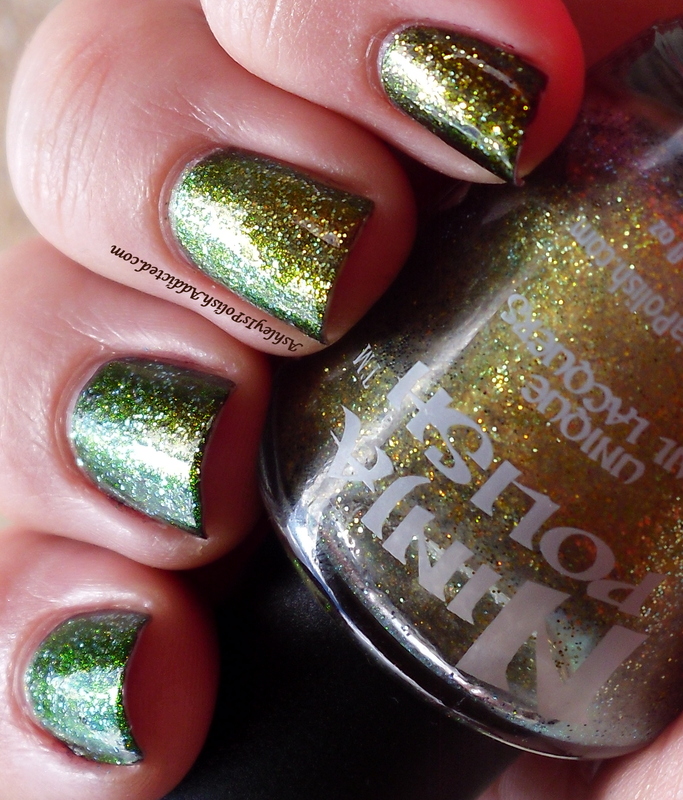 I am sure you have heard of Ninja Polish's Facets Collection - and if you haven't, where have you been?! The Facets Collection consists of Alexandrite, Color Changing Garnet and Zultanite. All three are amazingly gorgeous but I am showing you my personal favorite from the collection today - Zultanite. Before I talk about the polish I want to say that Ninja Polish is re-stocking this collection, along with a lot of other collections, today (December 15th) at 3 PM EST. For more information on the re-stock visit their Facebook page! Zultanite is not well known but is rare and phenomenal. The gemstone is a soft, gold that shifts to an amazing green. In honor of this gemstone we have a polish with equal beauty. This polish is also ideal over black to show its truest coloration but is truly amazing over a dark brown. The gold shifts through to an amazingly bright green. Again this polish is accented with amazing glitter that shifts right along with the polish. The sparkle and color shift of the glitters adds the most amazing brilliance to the polish and lives up to its name. They definitely hit this one spot on! This polish is nothing short of amazing. The way it shifts from bright green to copper, orange, gold, and deep red, it is simply breathtaking. This polish will shift color over light bases but it is best to put it over dark colors - the shifts and glitters just jump out at you. I only needed one coat over my base and it was completely smooth with one coat of top coat. I layered it over a plain black creme on all nails EXCEPT my ring finger where I layered it over A England Beauty Never Fails. I had a hard time narrowing down my pics for this one so there is a lot of spammage. The Facets Collection polishes retail for $11 and will be re-stocked TODAY at NinjaPolish.com. Make sure to follow Ninja Polish on Facebook and Twitter to stay up-to-date on re-stock info and sales! This is my favorite of the three as well! Oh my goodness, this is stunning!